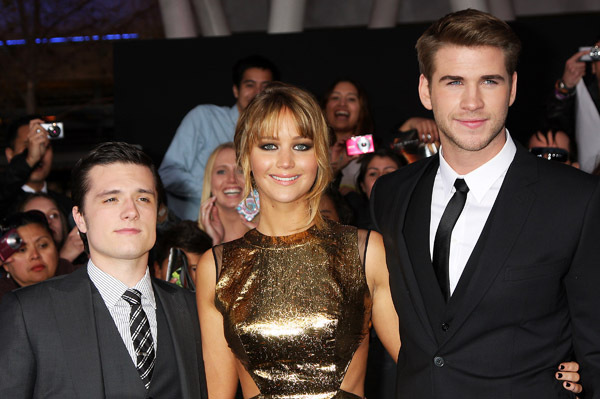 Inside look: The Hunger Games premiere! The much-anticipated silver screen adaptation of The Hunger Games is almost in theaters! The stars aligned Monday night in Los Angeles for the world premiere of the film… and SheKnows was there! Are the odds forever in your favor? Of course they are — The Hunger Games is almost ready for its worldwide debut in theaters around the world! March 23 cannot come soon enough, but we got a little taste of what we can expect on Monday night when the stars came out for the worldwide premiere of the film. The general consensus throughout the crowd? Excitement! The film — starring Jennifer Lawrence, Liam Hemsworth, Josh Hutcherson and Elizabeth Banks — has something for the whole family, actor Wes Bentley told us. “It kind of reaches all ages, kids love it for many reasons, but adults love it because it has sophistication and it’s about rebellion,” Bentley, who plays Seneca Crane, told SheKnows on the red carpet. The Hunger Games is also set to make Liam Hemsworth a mega-watt star, much like Twilight launched Robert Pattinson into the stratosphere. However, Miley Cyrus’ main squeeze isn’t getting caught up in all of the hype. That’s not to say that the cast wants his character, Gale, to end up with Katniss — most of the actors are Team Peeta all the way. Hutcherson, Peeta’s alter-ego, has to be happy to hear that. As for the best scene in the film? Banks said it’s all about a tearjerker. Will you see The Hunger Games when it hits theaters on March 23?